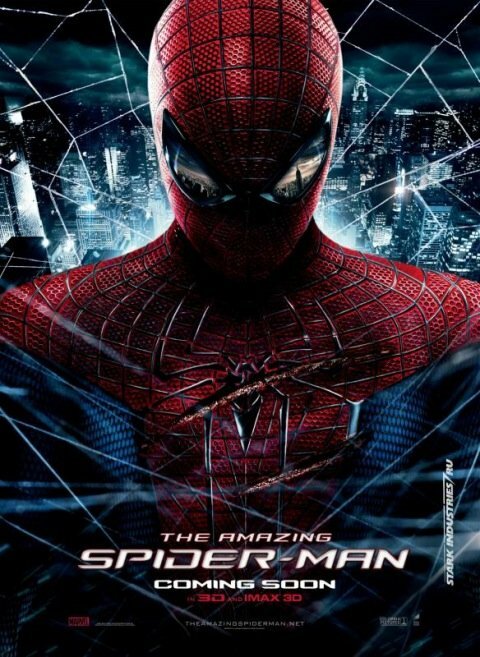 So Sony Pictures’ marketing campaign for this summer’s The Amazing Spider-Man appears to be ramping up overseas. On the heels of the extended Japanese trailer we featured on the site, we now have a brand new Spider-Man international teaser poster to share with you, courtesy of StarkIndustries.ru. The head looking down. The Lizard claw scratch across our hero’s chest. It closely resembles one of the earliest shots that Sony used to show Andrew Garfield in the classic Spidey suit. With one major difference: the Spider-Man mask is still on. I can’t emphasize enough how much it bothered me that Sam Raimi encouraged Tobey Maguire to rip his mask off in virtually every scene. I’m not paying to see a Maguire (or Garfield) movie. I want to see Spider-Man in action. And this new poster says to its audience that Spider-Man is the star of this movie … as it should be (with no offense meant to Garfield, who looks like he’ll make an excellent Peter Parker). So far, the posters for Marc Webb’s Spider-Man reboot have been pretty damn cool, starting with that elongated shadow of Parker perched on a wall. It’s encouraging to see the wallcrawler revving up his marketing campaign. It’s about time he stole some thunder away from The Avengers and The Dark Knight Rises, two films that are staking their claim in the coveted summer movie terrain but easily could lose some ground to Spidey if Webb’s movie turns out to be as awesome as we hope.